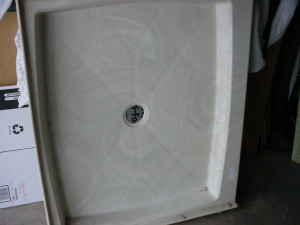 I found a very nice shower pan on craig's list. Only $60. I know that plastic shower pans cost $100 at Home Depot for the small 3'x3' size. I also saw a 4'x4' pan at the Habitat store for $100 but that is bigger than I need. Actually I need one that is 32" instead of 36" because my door is 37" from the wall. But I found this 36"x42" $60 shower pan and since it was such a great price I thought that I would figure out how to fit it in later. Maybe I can make my wall thinner. So I went over to the person's house and took a look at it. This thing is cultured marble and weighs a ton! Of course I wanted it and paid the money. It took 3 of us to hoist it in to my truck. When I got home I managed to slide it off on to a hand truck and get it to the stairs. I thought maybe I could walk it up the stairs. No way. It is still sitting at the bottom of the stairs waiting for assistance. $60 was a bargain assuming I can eventually get it inside. I don't have plans for an outdoor shower (haha). The next thing I am looking for is a small bathroom sink and a kitchen sink. There are plenty of those on craig's list but I'm looking for the right combination of price and included features like a faucet and a kitchen cabinet. I'm thinking that I could even cut a hole in the bottom of a plastic bowl and make my own bathroom sink if I run out of money for this project. Next weekend I think I should take a break and clear out more clutter. That big old TV needs to go to Best Buy for recycling. I'm tired of walking around it. And the kayak needs to go out in the shed until my friend picks it up. It's time for some pre-Spring cleaning! I need room to work. We have a spare shower tray in the shed but i suspect your new one is far better and definitely more hard wearing. Are you dog proofing the bathroom too??? The picture of it even looks heavy! I suppose shipping on your shower tray would have been more than $60. Too bad. I will be dog proofing the bathroom because that will also be the cat castle. Over the Cubicle, if i ever get a water leak that shower pan will fall thru the floor! I'm not sure stuffing stuff in to the shed (which I did today) counts as cleaning...but it looks cleaner in the mobile home.